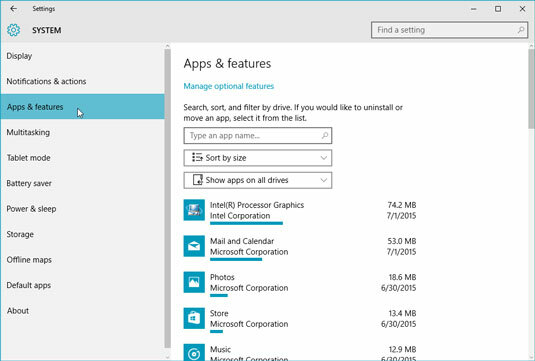 Removing an app from your Windows 10 Start menu doesn’t take much effort. Right-click the app’s tile from the Start menu and choose Unpin from Start from the pop-up menu. Click Start button and choose Settings from the Start menu. Click the System icon and then, when the System window appears, click Installed Apps from the window’s left pane. The Installed Apps & Features window appears, as shown here1, listing your currently installed apps and programs sorted by size. Click an unwanted app or program and choose Uninstall from the pop-up menu. To sort the programs by their installation date, click the Sort By Size button and choose By Install Date from the pop-up menu. You can also view programs installed on certain drives, which comes in handy on small tablets, where you want to store programs on memory cards rather than their main memory. Click the unloved program and then click its Uninstall or Move button. Move: When you’re running out of storage space, choose this option. It lets you move an app or program onto your tablet’s memory card, freeing up space for your files. Uninstall: Click this button — as well as the confirmation button that follows — to completely remove the app or program from your PC. Depending on which button you’ve clicked, Windows either boots the program off your PC or moves it to another disk drive or memory card. After you delete a program, it’s gone for good unless you kept its installation CD. Unlike other deleted items, deleted programs don’t linger inside your Recycle Bin. Mistakenly deleted apps, however, can almost always be relocated and reinstalled from the Windows Store. Always use the Settings app to uninstall unwanted programs. Simply deleting their files or folders doesn’t do the trick. In fact, doing so often confuses your computer into sending bothersome error messages.